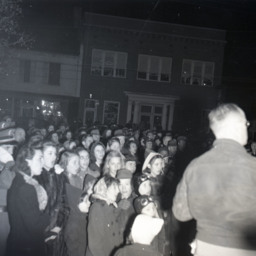 Photograph of a gathering at Court Square in Woodstock. 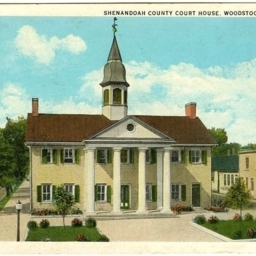 Color postcard showing the historic Shenandoah County Courthouse in Woodstock Virginia. 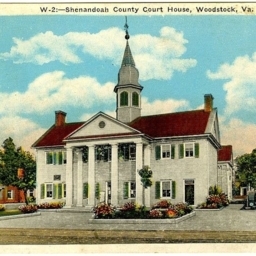 Shenandoah County Court House, Woodstock, Va.
Color postcard with a drawing of the historic Shenandoah County Courthouse in Woodstock Virginia. 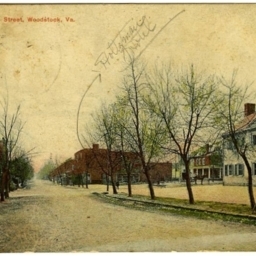 Postcard with a picture of Main Street at Court Square in Woodstock Virginia. Visible is the Shenandoah County Courthouse, jail, and other downtown buildings. 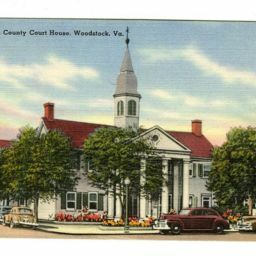 Color postcard with a picture of Court Square in Woodstock Virginia. Shown along Main Street are the county courthouse, jail, Irwin Opera House, and several other buildings. 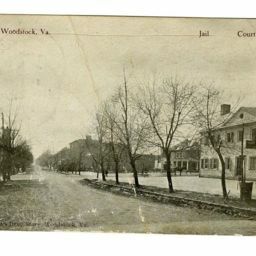 Postcard showing a picture of Court Square in Woodstock Virginia. Pictured along Main Street is the county courthouse, jail, the Irwin Opera House, and several other structures. 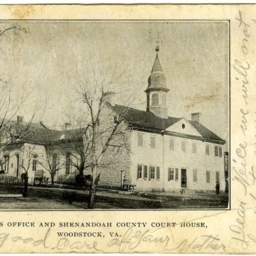 Postcard with a picture of the historic Shenandoah County Courthouse in Woodstock Virginia. 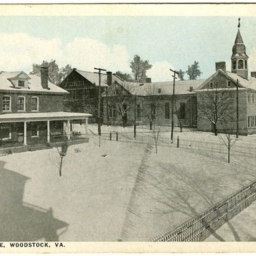 Postcard with a picture of Court Square in Woodstock Virginia. 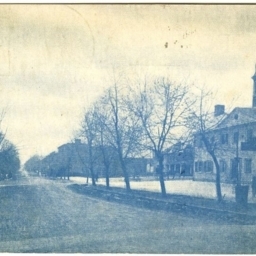 Pictures is the jail, jail yard, and the Historic Shenandoah County Courthouse built in 1795. 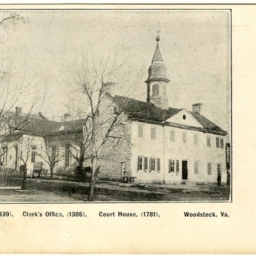 Postcard with a picture of the historic Shenandoah County Courthouse (built in 1795) with attached clerk's office and additional courtroom. 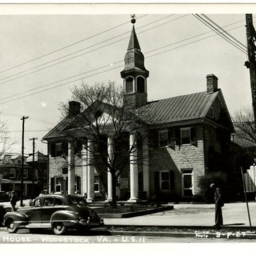 B&L Asson., Clerk's Office, Court House, Woodstock, Va.
Postcard with a picture of buildings along Court Street in Woodstock Virginia. Pictured is the Shenandoah County Building and Loan Association, the Clerk's Office, and the historic courthouse. 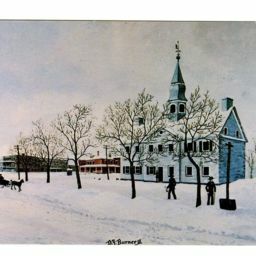 Color postcard with a picture of the Shenandoah County Courthouse's weathervane. 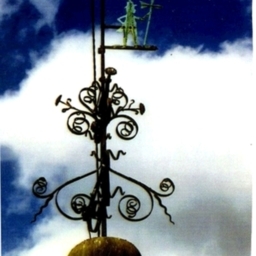 While this vane is a reproduction, the unknown figure which tops the building was originally installed in 1795.